Two legendary superheroes collide as Daredevil faces Spider-Man in an all-out fight for justice! 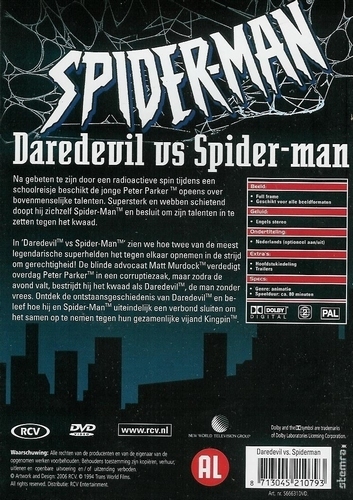 Dwelling in a world of eternal darkness, attorney Matt Murdock defends Peter Parker by day, but at night he takes to the streets, battling anyone in his path as he searches for truth... and revenge. Discover the origin of Dardevil, "The Man Without Fear," and witness the thrills as he and the Webslinger ultimately team up to take down their supreme nemesis, Kingpin. It's an animated, epic clash you'll want to experience over and over again!